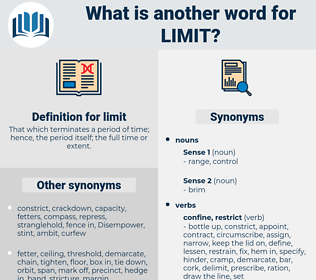 What is another word for limit? That which terminates a period of time; hence, the period itself; the full time or extent. limes, cutbacks, restrict, fences, less. restrict, constraining, time-frame, requirement, margin, seam. Mitigating, existing, minimising, diminishing, confining, halting, constricting, Concentrating, Stemming, neighbouring, touching, pushing, Cruising, sparing, bounding, according, Doing, restricting. are, curtail, confine, inhibit, prevent. curtails, inhibits, restrains, impedes, contains, impairs, hinders, Narrows, controls, hampers, confines, undermines, encompasses, weakens, places, keeps, restricts. increased, curtail, restrain, confine, mitigate, restrict, diminish, inhibit, constrict, minimise, hamper, hinder, eliminate, Ring-fence, stem, shorten, delineate, rein, impair, demarcate, impose, fetter, moderate, prevent. limiter, constraint, restricting, restriction, ceiling, restrictiveness, threshold. inside, interior, freedom, commencement, center, start, infinity, minimum, beginning, middle, limitlessness, opening, liberation. land, citadel, region, estate, territory. allow, liberate, encourage, free, aid, permit, extend, let go, expand, raise, help, assist, release, unbound, increase, open, strengthen. You say I can go the limit? Why limit us at all? lentia, land, landed, lionet, liniment, lento, luanda, landau, loment, lowland, lemon-wood, laminate, lund, laniidae, lomatia, lenity, limonite, lineament, lint, lunate, Luna Moth, lintwhite, limited, lined, lunette, linnet, lent, lind, lemon mint, lie in wait, lone hand, line duty, lamented, limanda, lemonade, lend, lemonwood, lay into, lunt, lamedh, limeade, lanate, lament, lindy, lunda, lean-to, lenient, lam into, limited audit, lamnidae. level best, maximum, brink, knife-edge, heat barrier, utmost, verge, thermal barrier, Utterness, uttermost, absoluteness, starkness.